Erin Blegen: My Scrap Cabin: Scrap FX Reveal #2 & #3!! Scrap FX Reveal #2 & #3!! September Prima BAP & BITW "Story"
C'est Magnifique October Kit Reveal!! Manor House Warehouse Sale This Weekend!!! Reminders & a (Giveaway) Sneak!! Webster's Pages: Old & New How-To! Live Chat With the Webster's Pages Designers :)~! Once Upon A...Sketch teams up with CSI!! Manor House Creations & The Scrap Cake! My first Manor House Creations post!! Good afternoon! I hope your weekend is going well- it's a GORGEOUS day here and I'm planning to take the kids out this evening for some fall pictures before the leaves are all gone. We had a great birthday party last night for DH and some of you were interested in the recipe for his Chocolate Chip Cookies Surprise Cake~ well, you can find the amazing recipe HERE!! He requests this for his birthday every year as he's a yellow cake AND chocolate chip cookie fanatic- and finding this recipe just seemed too perfect for him :). I hope you enjoy it too! I have owned various animals throughout my life from horses to cats and dogs to shrews, bumblebees, birds of all kinds…but almost always, we had chickens. My sister and I used to dress up our chickens in doll clothes! I’ve had a special connection to them all my life and currently have a very interesting and diverse flock. Almost all of my chickens are of different rare breeds and I own both standard and bantam (miniature) size birds. This summer, I let several different hens set on eggs. We hatched out a couple different sets, and the two darlings in my layout were from the second set, with a mother hen who was a little slow to take to her duties. Thankfully I’m a great “mother hen” myself and took care of the babies until the mom was ready. Luckily since then, she’s turned out to be a great mom and I’ve really enjoyed having these fuzzy little guys around . 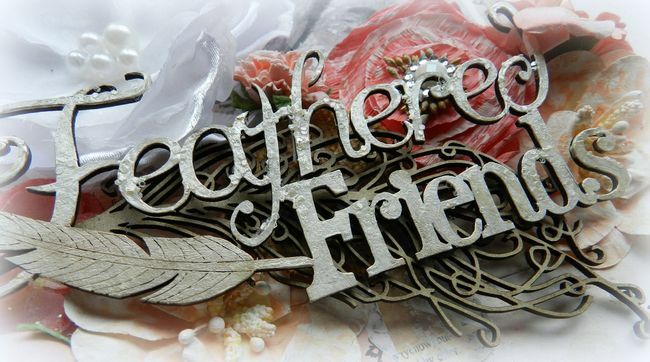 I used some bisque liquid pearls and glitter to accent my “Feathered Friends” title. The beautiful “Ruffled Feather” I placed underneath and thought it was just so beautiful as it was . This intricate “Birdcage C Vine” piece was the perfect addition to my layout. I love it! Just a couple teeny little liquid pearls and a resin bird and I was set. I couldn’t not use one of these “Feathers“. Just settled in amongst my flowers seemed right. I allow my chickens to free range here (meaning they are not kept in their coop all the time- only at night), so they’re all over the place, all day long- and you can bet I find feathers everywhere!! 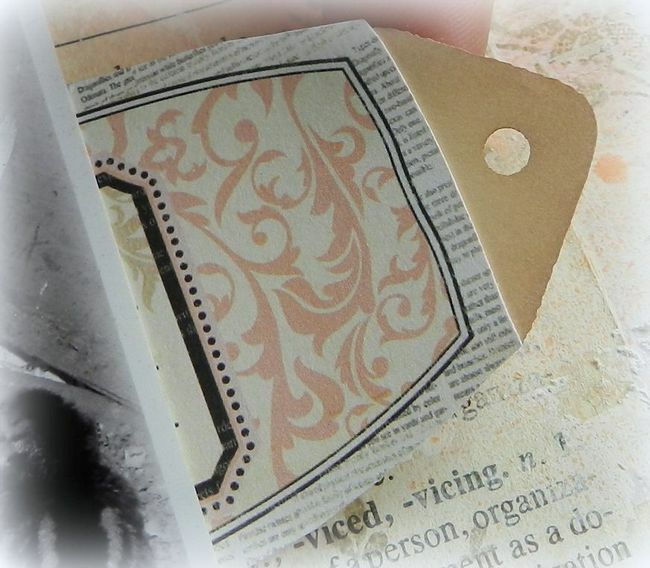 I’ve used a tag from the “Tags, mixed cream” pack to create a tab for my hidden journaling. 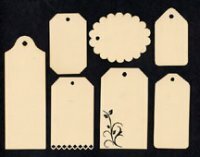 These tags are of different lengths and widths, making hidden journaling a snap on any layout! Next I have a card for you! 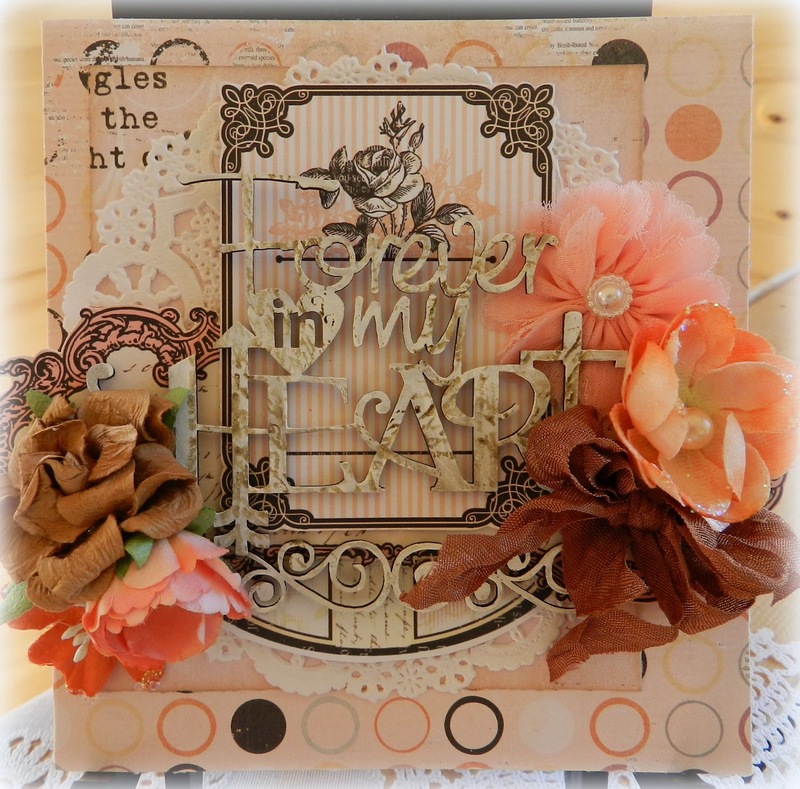 I know that this “Forever in my Heart” title was meant for a layout about a the loss of a pet, but I thought it would be a perfect sentiment for a sympathy card. I’ve painted it with gesso and then used a script stamp and distress ink over top. The pretty scroll piece beneath my title is actually snipped from what I had left of the “Gates A, large (scrolls)“, used in part on a layout a while back. I definitely love getting the most out of my chipboard and here’s just one example of how to do that! Thanks for stopping in~ I'll be back tomorrow to reveal my October giveaway!! See you then :)~! Beautiful, beautiful layout and card! 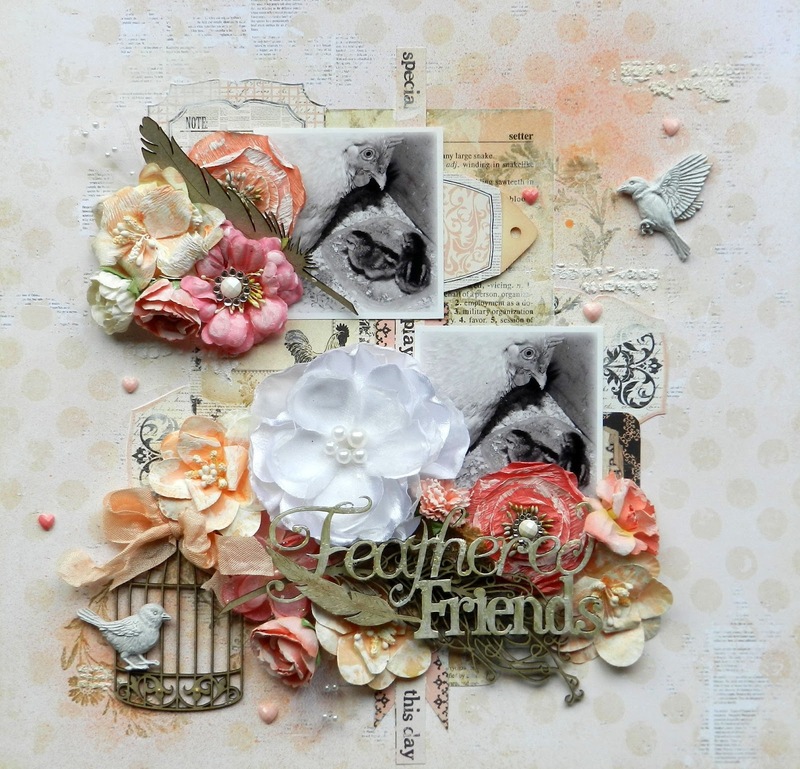 Love that chipboard and the gorgeous flowers. Thanks for sharing the recipe. Have to give it a try. this is awesome!! you did a fabulous job with these chipboards!! as always you never disapoint!! You create the most gorgeous projects. WOW! Gorgeouse layout and card !!! :) Tfs ..
this is so fun Erin, our pets are so cute to scrap, and your chickens are adorable! love the card too, the way you stamped on the chipboard, nice! 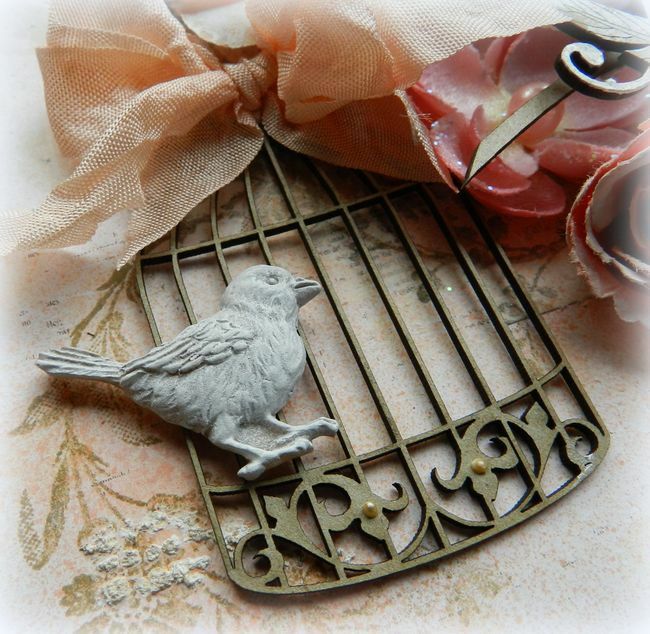 Love the way you used feathers on your layout about the sweet chicks. Do you get different colored eggs from your flock? My husband's grandma had some rare breeds in her old flock, and she used to get pink and pale green eggs from them! These were South American hens. They thrived on Grandma's Montana farm; not sure how they would react to MN temperatures, as I have no poultry raising experience myself. SO beautiful Erin!! Love those pretty birds you used and the feathers, especially!! The flowers are gorgeous and I love the colors on this one! What a heartwarming page! 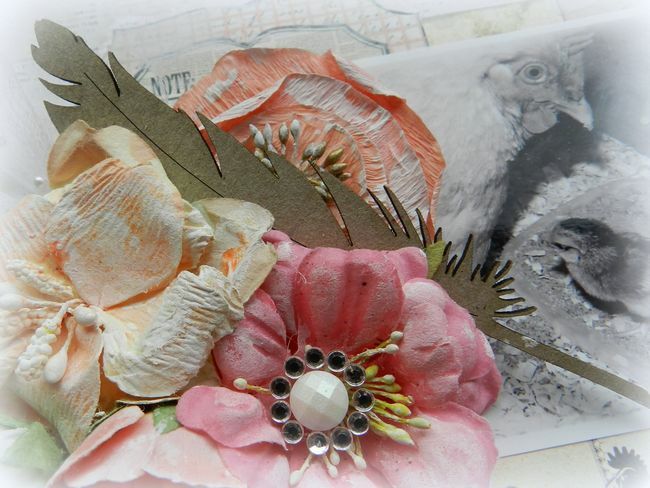 Love how you used the chipboard elements! love both of your creations...gorgeous as always! Я получаю огромное удовольствие, рассматривая твои работы, так все интересно сделано! !